DON’T go to Tai Wu! Another reason not to go to Tai Wu. One of Manchester’s largest restaurants has been fined £3,000 after health inspectors found cockroaches there. 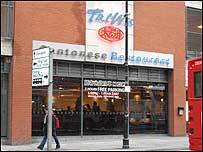 The Tai Wu Cantonese on Oxford Street closed down voluntarily for three days after the inspection in 2006. Inspectors found an “active” German cockroach infestation and a lack of cleaning of the premises and equipment. Manchester magistrates also ordered Fully Base Ltd, which owns the restaurant, to pay £4,100 in costs for three breaches of food hygiene laws. The Manchester City Council environmental health officers went to the eatery in October 2006 following a complaint by a member of the public. They noted food debris around and beneath equipment in the food rooms and bamboo steaming baskets stored in dirty conditions. The flooring was so damaged that it could not be cleaned effectively, the inspectors said. Councillor Neil Swannick, executive member for environment at Manchester City Council, said: “We will not tolerate this sort of negligence and disregard for public health. “The Tai Wu is one of the largest restaurants in the city serving around 10,000 meals a week. The Tai Wu closed down for a few days to carry out improvements. This morning I just want to let every know that I am an Excel Specialist. 4000 hits for half a month! 11hits per hour! OK I am modest, and on such a rubbish blog, I am getting these hits are scary. So I vow to improve on these figure, write better and interesting stories to please my audience. No more Simon. I am deleting Simon. To any new people including work. Protected: Be real – Who am I? I am losing the plot – going mad, day by day. I need the holidays to refresh. I work best under pressure but lately I don’t enjoy it as much as I use to. I need a change before I lose the option to change. Protected: The world is not enough!